If you’re an avid reader of CF, you know that we believe fashion inspiration goes beyond storefronts, magazines and runways. In the past we’ve found inspiration from Disney characters, books, TV shows and even music. However, until now, we haven’t really covered one of the more recent forms of media entertainment, video games. Whether you’ve played on an N64, a Gameboy Color or a Wii, you’re probably familiar with Nintendo’s series of Mario games, which has over 200 titles. Since I used to adore playing these games, (Heck, I still do!) I thought it would be fun to create some looks inspired by Mario and the gang. No worries though, these won’t be cosplay outfits, but instead totally wearable looks for every day. This week, I created outfits inspired by Donkey Kong, Rosalina, Waluigi and Toadette. For more Nintendo-inspired posts, check out Part 1 (Mario, Yoshi, Peach & Bowser) and Part 2 (Luigi, Daisy, Toad & Wario). 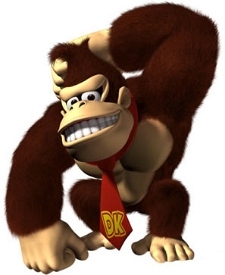 DK is a heroic ape who resides on Donkey Kong Island. 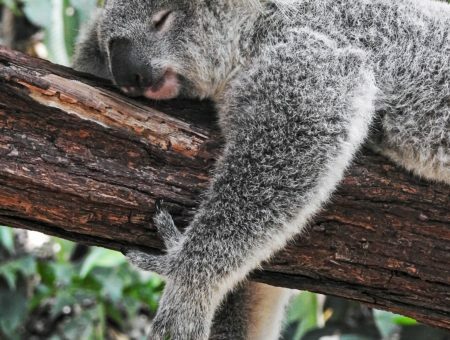 He’s a carefree kind of guy who enjoys spending his day eating bananas. However, when trouble arises, he’s always the first one to jump into action, defeating enemies with his strength and penchant for hurling barrels. DK is friends with Mario and likes to attend his parties and participate in sports. He even stars in his own series of games — Donkey Kong Country. Even though DK is merely an ape in a necktie, I created a cute and casual outfit inspired by his environment and coloring. I paired a slouchy striped sweater with some chocolate brown trousers to create a comfy everyday look. These red flats are a similar color to DK’s tie, while the chandelier earrings remind me of the bananas he likes to eat. Finally, this ring symbolizes the jungle DK resides in as well as the barrels he throws. 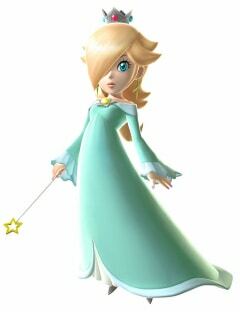 Rosalina is a powerful character whose duty is to watch over the cosmos and star-like creatures called Lumas. She is one of the newer characters in the Mario series and made her first appearance in Super Mario Galaxy. During the game, she comes to Mario and Luigi’s aid during their adventures. Rosalina is able to float, and when in danger, can produce bubble-like force fields to protect herself and others. For this look, I wanted to create a gorgeous formal look inspired by Rosalina’s outfit. This pretty dress from ModCloth is a similar color to the gown Rosalina wears. I paired the dress with some glittery silver pumps and added a gold ring with a similar stone to the one in her crown. Since she looks after the Lumas, I chose to accessorize with a delicate star-shaped bangle and a braided headband to symbolize her crown. 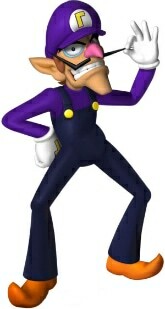 This skeevy-looking guy is Wario’s partner in crime, Waluigi. The two of them are always bickering with each other, but when they get along, they’re a force to be reckoned with. Waluigi is also Luigi’s nemesis and enjoys taunting and playing tricks on our green-clad friend. Waluigi is a talented athlete, but is an extremely sore loser and is quick to lose his temper. He hasn’t starred in any of his own games yet and, like Daisy, only appears in the Mario Party and sports games. Channel your inner Waluigi by pairing some dark-wash jeans with a pretty purple off-the-shoulder top. This knitted beret represents his hat and the necklace has a similar shape and color to the buttons on Waluigi’s overalls. Complete this look with these adorable and causal flats, which look much more stylish and comfortable than Waluigi’s elf-like boots. 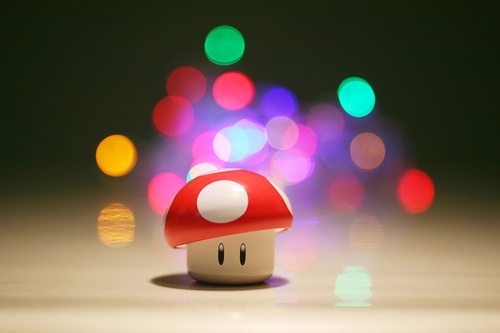 This little cutie is Toad’s pal, Toadette. Like her male counterpart, she has a childlike appearance and fun personality. But despite her bubbly persona, Toadette gets upset easily when wronged. She’s friends with Mario and the gang and is always open to helping them during their adventures. Toadette is ultra-girly, so I created a feminine look inspired by her character. I chose a pale pink polka-dotted sweater dress, which reminded me of her hair and cap. 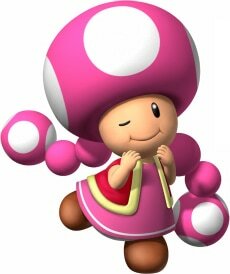 Next, mimic Toadette’s waistcoat by layering a dark pink coat over the dress. Add some gray tights for warmth and accessorize with these adorable heeled booties, which look similar to her boots. For the finishing touch, add a fun mushroom-shaped ring. Which outfit is your favorite? Who is your favorite Nintendo character? Have you ever been inspired by video games? Be sure to leave a comment and let me know your thoughts!